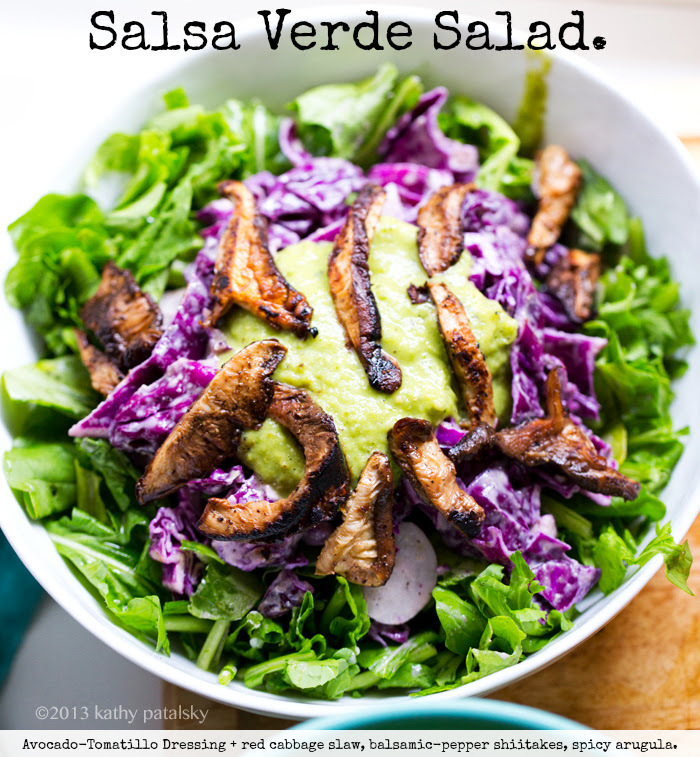 Salsa Verde Salad: Spicy Avocado-Tomatillo Dressing + Mushrooms. I often say that you eat a good salsa verde with a chip. You eat an amazing salsa verde by the spoonful! 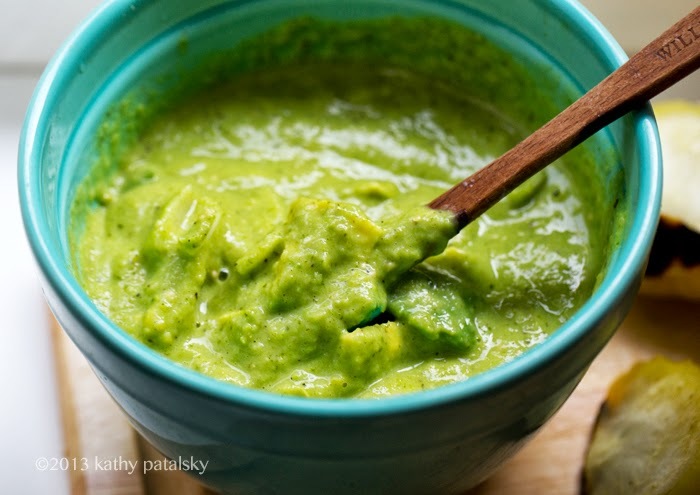 In fact an extra-creamy, delicious salsa verde can easily be used as salad dressing. Which is what I did here with some tasty results..
Verde. I made this salad a few weeks ago and haven't forgotten about it. It is definitely worth trying if you are a "salsa verde" lover like me. 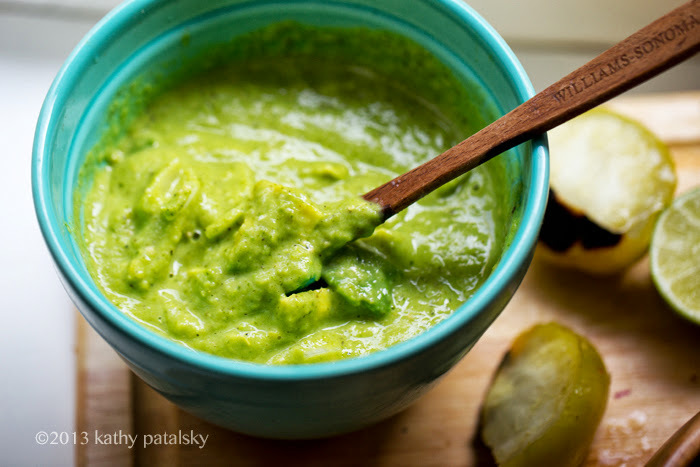 My salsa verde-inspired dressing includes creamy avocados, roasted tomatillos and cilantro. Richness from the avocados swirls with juicy perkiness from the smoky roasted tomatillos and cilantro. I generously poured it over top a bed of chopped spicy-fresh arugula greens and some quickie marinated red cabbage slaw. On top, some sizzling strips of pepper-balsamic shiitake mushrooms. You could take this salad one step further and add some sweet roasted corn, warm lentils, candied nuts, pinto beans, chipotle tofu or tempeh or even some cashew cream. 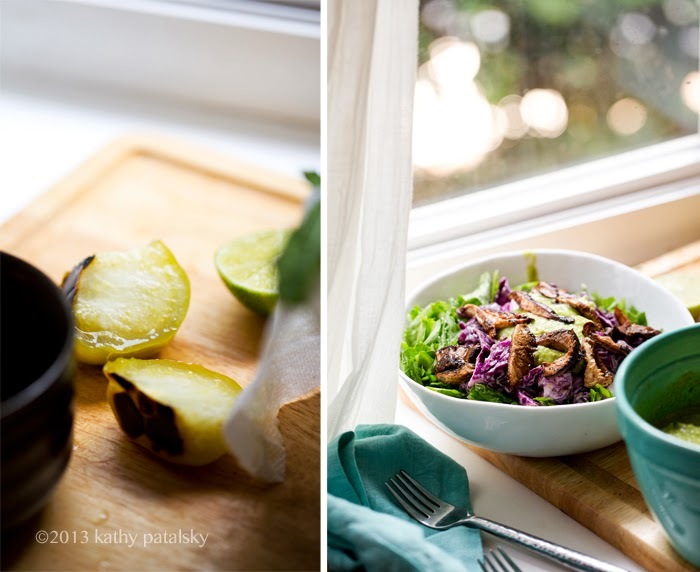 Get spicy and "go green" for your next salad feast..
Again, thank you for all the message via this post and this post on Nelly cat. I am catching up on replying to every single comment, but I swear everytime I start reading them I find myself in tears with what you guys share, so I have been reading comments every few days or so. I will update you guys with any news, but for now I am so happy spending my days with a still healthy-acting Nelly. I am heaven simply watching her roll in a morning sunbeam or sprawl out in my bed, curling up into a fuzzy sweet ball as she smushes against my soft pillow or her favorite fuzzy blankie. And as I said in my last update post, the Xray we have in two weeks will really tell us how quickly the cancer is moving. Thank goodness she is still her perky (mostly normal) self. I know she is oozign with happiness from all the gobs of attention. Kisses and hugs and purrs to you all, words cannot describe how much many of you have entered my heart from the stories and advice you have shared with me. 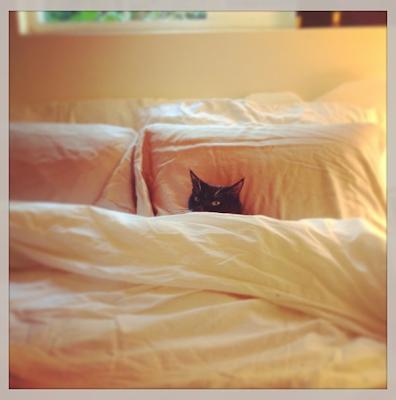 Nelly last night when she hopped into our bed right after we had washed and changed all the sheets, blankets and pillowcases. They were still warm from the dryer..
Back into normalcy for now. I have noticed Nelly likes when I give her a breather of mommy love, aka smothering her in kisses, yummy food, rubs, rolls and more. She is a CAT. And cats need to rest. A lot. Some say senior kitties need 16-18 hours of shut-eye! So while Nelly snoozes I have to do something normal. Writing, cooking and photographing, thank goodness, is not only my job - but a great love and passion of mine. So it brings me joy amidst this time of wavering and uncertainty. 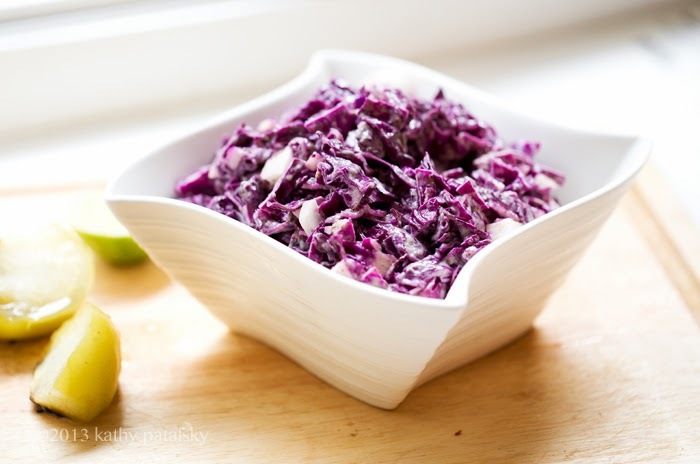 red cabbage slaw - this stuff is delicious on its own too! Salsa Verde Lovers' Salad. It is super delicious and refreshing. The flavors are lively and comforting at the same time. 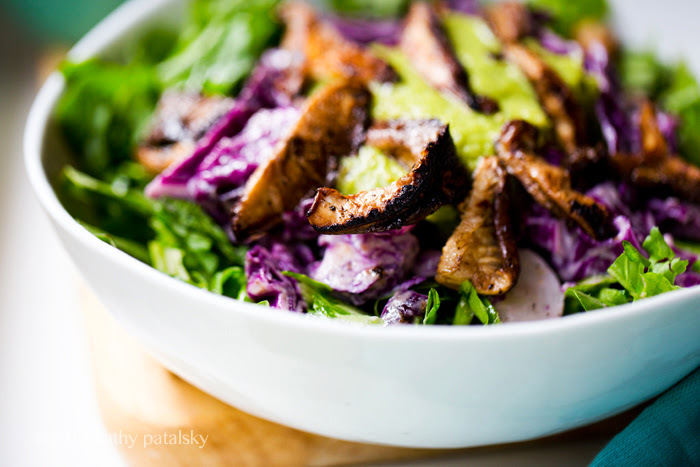 The addition of chilled cabbage slaw and perky arugula makes it a real "cruncher" of a salad. The arugula greens make the salad quite spicy too. 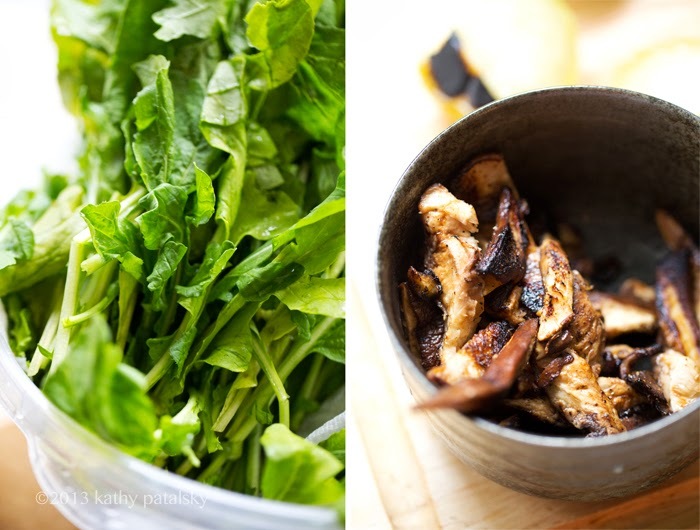 You can tone things down a bit by using baby arugula or another base green like kale, spinach, romaine or chard. 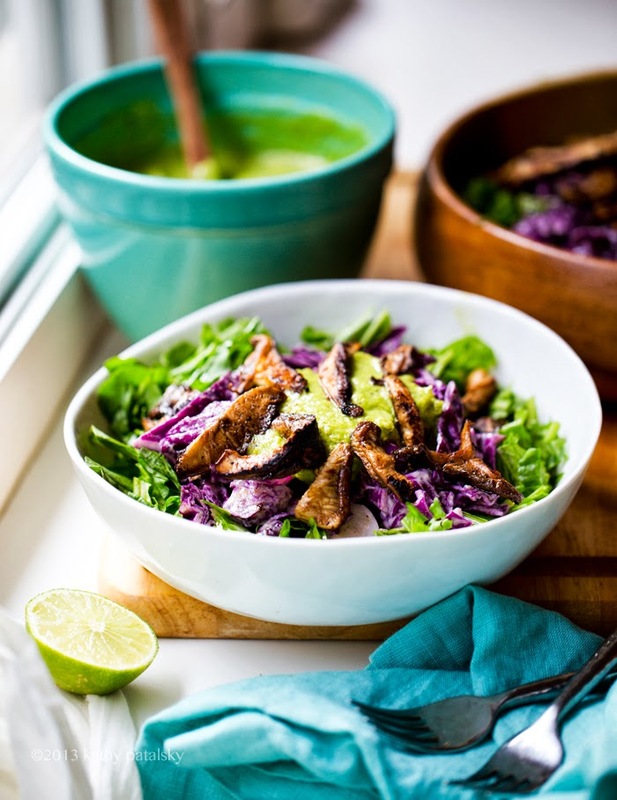 The savory, peppered balsamic shiitakes pair quite nicely with the Mexican flavors in the dressing. 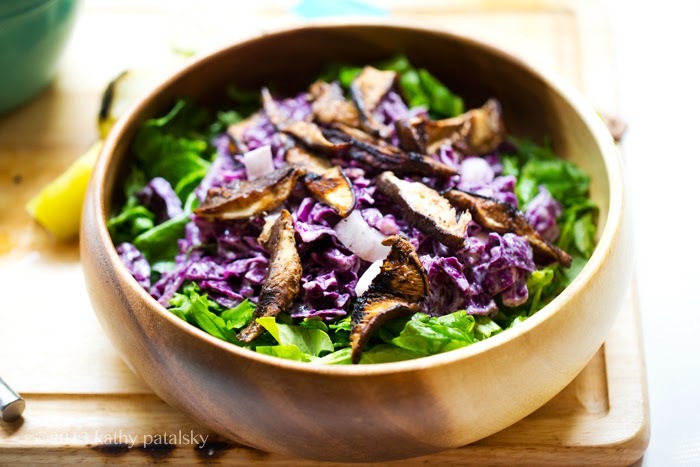 The chilled tahini slaw adds a refreshing crunch and chilled accent to the fresh dressing and sizzling hot mushrooms. Beans, tempeh, cashew cream, roasted corn or tofu would be awesome on top of this salad to boost protein a bit more. 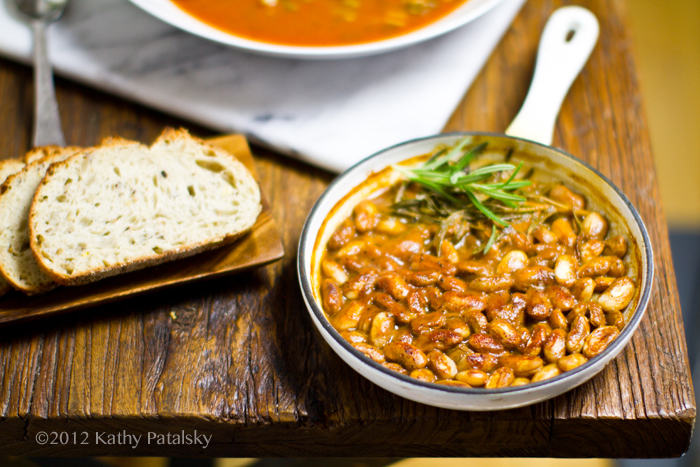 Roasted beans on the side or top - added yum! 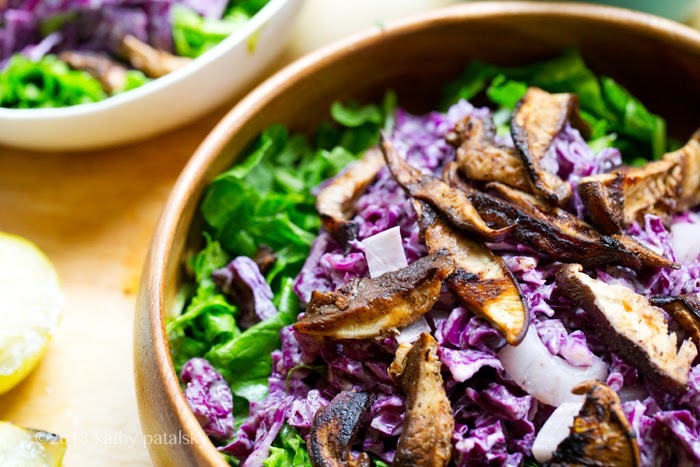 Roasted corn would add a sweet + vegan buttery accent to this salad! Dressing modifications: Add 2-3 Tbsp nuts or seeds blended or folded in (walnuts, toasted pepitas, candied pistachios, hemp seeds..) Or for a sweet spin, try adding some roasted corn to the dressing blend or folded in. 1. I like to make the red cabbage slaw the day before or at least a few hours in advance so that it has time to marinate and chill in the fridge. 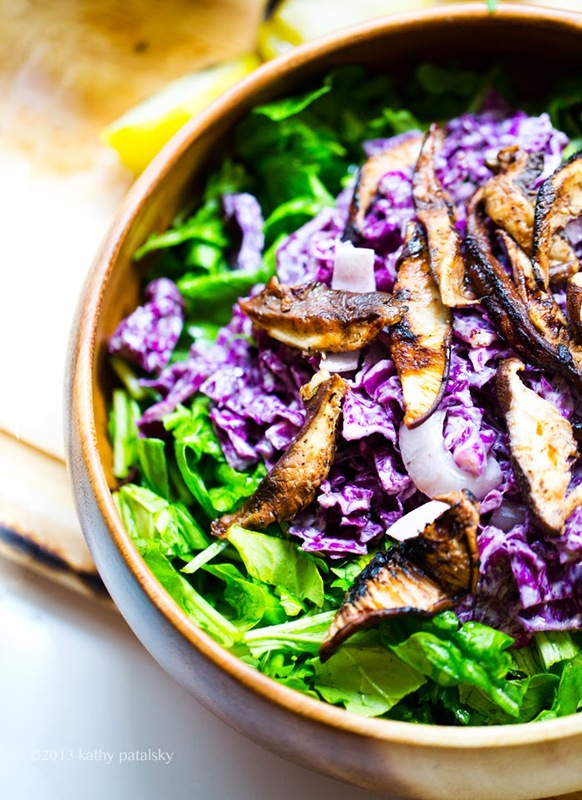 Chop your red cabbage and toss well with tahini, sweetener, pepper and acid (lemon, lime or vinegar). Add salt to taste, start with 1/4 tsp. You can also sweeten to taste. Feel free to get fancy with this slaw by adding in toasted pumpkin seeds, candied walnuts, chopped pistachios, corn, sliced onion and more. Or leave it simple and sassy. Speaking of sassy, add some cayenne for a hint of heat. Cover an place in fridge to chill. 2. To prepare the salad, you first want to prep the dressing. First wash, slice and roast the tomatillos. 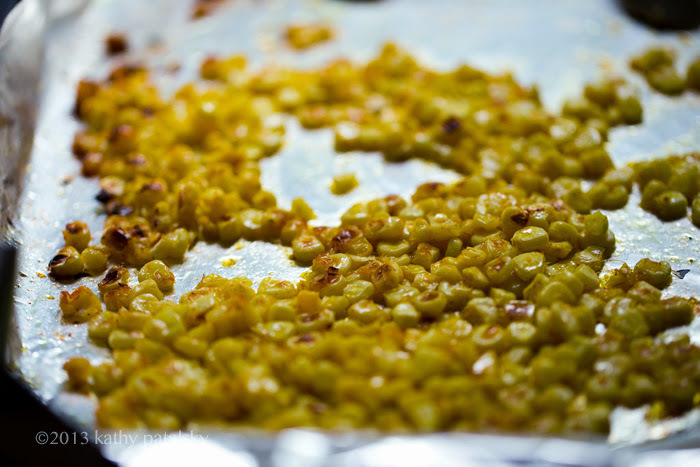 You can do this in a simple pan on the stove or in a hot oven. Roast until the skin starts to blacken, darken and crack. 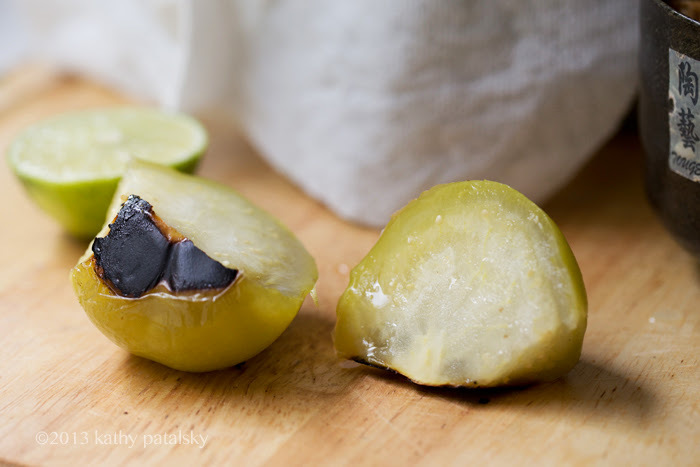 The tomatillos should be very tender and juicy when sliced. 3. Dressing: Add all ingredients to a blender or food processor. Blend until smooth. Note: For chunky-style dressing, leave out half of both the chopped onions and diced avocado and fold in after blending. Season your dressing to taste - salt and add spices. I used a little under 1/2 tsp salt. Place dressing in fridge if you want cold dressing. I like mine slightly warm to room temp, freshly blended. If you want room, temp, cover and set aside. 4. Next, wash and dry your greens. Toss greens with 1 Tbsp of your favorite healthy cold-pressed oil, a squeeze or lemon or lime juice, pinch or salt and pinch of pepper. Toss well. Add greens to serving bowl. 5. Top greens with cabbage and set aside. 6. 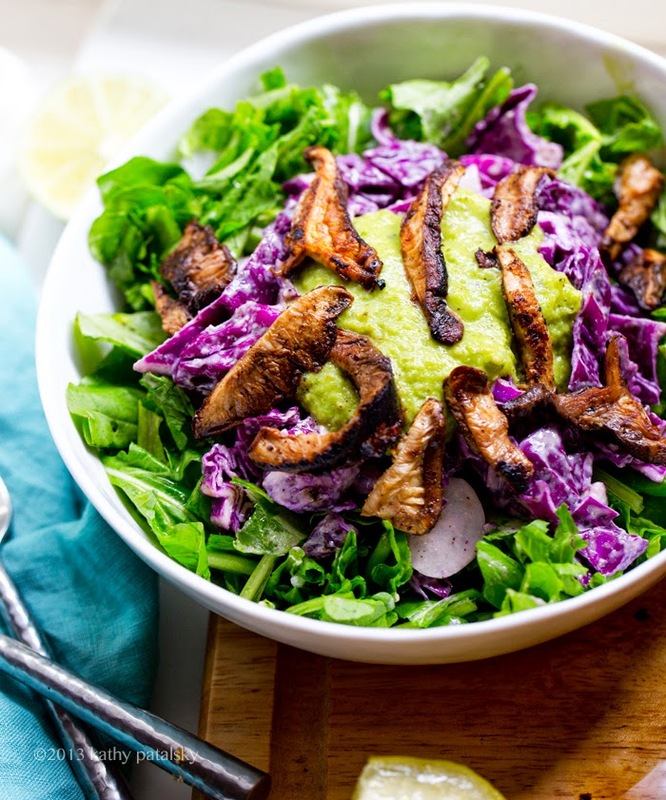 For the mushrooms, grab your sliced shiitakes and toss them into a sizzling hot pan - that has been oiled with about 1 tsp sunflower, safflower or olive oil. The mushrooms should sizzle when the hit the hot oiled pan. Allow them to cook, without moving them around for about a minute - this will sear a nice black color into the edges. Toss a bit in pan and add dry spices. Lastly, lower heat to low and add the balsamic vinegar. The pan will sizzle quite a bit. Shake pan and allow liquid to absorb and cook off. Turn heat back to high for last minute or cooking - add more black pepper right before removing mushrooms from pan to get a nice dry spice coating. If using nutritional yeast, you can add at the end of cooking as well. 7. 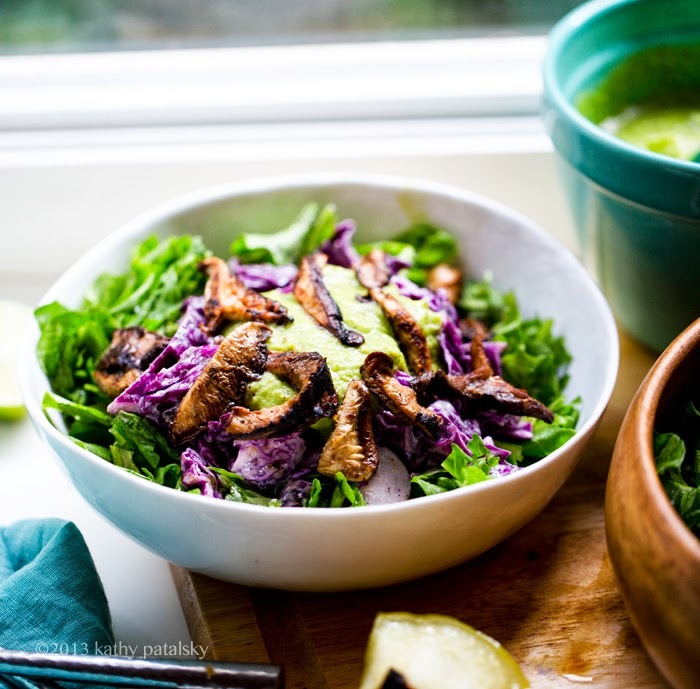 Top your greens + cabbage bowl with a generous portion of salsa verde followed by the sizzling mushrooms. Add any other toppings like beans, cashew cream, tofu or tempeh. Serve right away to get that delicious hot and cold flavor sensation.